The following examples illustrate the broad range of discovery space covered by XMM-Newton, from Solar System science to cosmology. Many Solar System objects are known to emit X-rays. Soft X-ray emission (0.1-2 keV) has been detected from the Sun, from 5 planets (Venus, Earth, Mars, Jupiter and Saturn), several satellites of planets, and active comets. A number of mechanisms are responsible, among them charge exchange and fluorescence. The former occurs when an ionized atom collides with a neutral atom or molecule and captures an electron into an excited state which upon decaying emits an X-ray at a characteristic wavelength; the latter arises when X-rays from the Sun hit atoms of elements such as oxygen in the atmosphere of the planet, and this radiation is re-emitted at a characteristic wavelength which identifies those specific elements. Observations of planets with XMM-Newton are rare. In the past decade Mars has been observed once, Jupiter twice and Saturn three times. 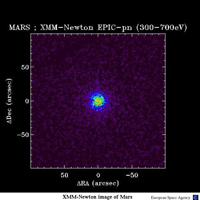 High-resolution X-ray spectroscopy with XMM-Newton confirmed that the X-ray emission from Mars is composed of two different components: one due to fluorescent scattering of solar X-rays in its upper atmosphere and the other one due to solar wind charge exchange in its exosphere. This was the first definite detection of charge exchange induced X-ray emission from the exosphere of a planet other than Earth. Pulsars are rapidly spinning neutron stars typically observed as isolated, radio-emitting objects. 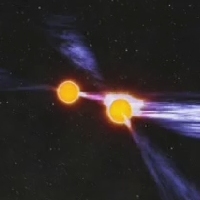 The coupling of two pulsars orbiting in a binary system, as in PSR J0737-3039, is an extremely rare phenomenon and provides an opportunity for a variety of investigations such as strong field gravity, the equation of state of super-dense matter, and magneto-hydrodynamics. Observations of X-ray emission are a fundamental component of these studies, in particular for aspects concerning the physics of the interacting pulsars winds and magnetospheres in the close environment of the two neutron stars. XMM-Newton observations of the unique double pulsar system PSR J0737-3039 confirmed pulsed X-ray emission from one component and, for the first time, provided strong evidence for X-ray emission from the second pulsar. The XMM-Newton data showed that this unusual system displays complex X-ray behaviour and provided important new measurements to test against models. NGC 346 is one of several star-forming regions observed by XMM-Newton. Credit: ESO/ESA/JPL-Caltech/NASA/D. Gouliermis (MPIA) et al. 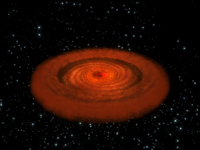 Since the early 1980's star formation regions are known to emit X-rays. Measuring and monitoring the X-ray emission in these regions is important as X-ray emission impacts many of the processes involved in star formation, for example, it stimulates accretion by disk ionization via coupling with magnetic fields, it ionizes the interstellar medium, heats the gas, and modifies its chemistry and the dust grain composition. XMM-Newton has studied a number of star-forming regions including NGC 346, a bright, active star-forming region in the Small Magellanic Cloud (SMC), an irregular dwarf galaxy nearby to our Milky Way. 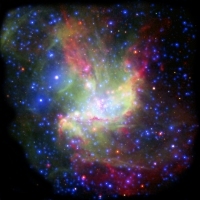 This multi-wavelength false-colour image of NGC 346 combines X-ray (blue, from XMM-Newton), infrared (red, from Spitzer) and visible light (green, ESO’s NTT). The infrared light shows cold dust, visible light denotes irradiative gas, and X-rays represent hot gas. The features of NGC 346 visible in this combined image demonstrate that stars in this region are being created by two different types of star formation, one radiation based, the other triggered by wind. Red-orange filaments of cold dust surrounding the centre of the image indicate where the intense radiation from the more massive stars provides enough energy to expand the gas and compress the cold dust into new stars. A bubble, seen as a blue halo to the left and located within a large expanding gaseous shell, is believed to be caused by the supernova explosion of a massive star whose strong winds compressed the remaining dust in the parent cloud and formed younger small stars, seen at the top of the image. The Orion Nebula is one of the most studied regions of star-formation. It is a nearby (about 1500 light years away), large (the central bright region covers about 1 square degree) stellar nursery that is home to thousands of stars in various stages of formation. The energetic stars of the nebula have blown away much of the obscuring gas and dust clouds providing a clear view in a region of active star formation and evolution. Observations of this nebula have provided important new insight into the formation of stars and planets. While gas in star-forming regions is usually relatively cool, XMM-Newton discovered that the Orion Nebula also contains a huge cloud of extremely hot gas, or plasma, heated to millions of degrees. The images above show the Orion Nebula with a huge cloud of high-temperature gas discovered by XMM-Newton. The left panel is an X-ray image obtained with XMM-Newton, with the hot gas seen as a red haze. The right panel, a Spitzer infrared image of the Orion Nebula overlaid with XMM-Newton X-ray data (in blue), shows the newly discovered hot gas cloud. The Orion Nebula is the nearest dense star-forming region to Earth that contains stars much more massive than the Sun. XMM-Newton’s newly-discovered gas cloud is composed of winds blowing from these high-mass stars that are heated to millions of degrees as they slam into the surrounding gas. Prior to this discovery it was generally thought that powerful supernova explosions would be required to produce such a huge, hot plasma cloud. This result suggests that such X-ray outflow phenomenon should be common in star-forming regions, and therefore widespread throughout our galaxy. Far from being 'island universes' as was once thought, galaxies are now known to form and evolve by interacting with their environment and with neighbouring galaxies. Collisions and mergers are believed to be key mechanisms involved in this process. The gravitational interactions between galaxies produce giant tidal waves in the discs of the galaxies, giving rise to spiral arms and provoking outbursts of star formation which can be traced in X-rays. The Antennae Galaxy is one of the closest and most studied galaxy mergers in the Universe and consists of two gravitationally interacting galaxies that collided with one another a couple of hundred million years ago. This galaxy system has a high rate of supernova explosions which heats the gas to millions of degrees so that it glows in X-rays. The left hand panel shows a false-colour XMM-Newton EPIC image of the interacting Antennae galaxies overlaid with a greyscale optical Digitised Sky Survey image. The right hand panel shows an enlargement around the interacting region in the X-ray only. The EPIC image is false-coloured as follows: Soft (0.2-1.0 keV) photons are shown in red, medium (1.0-2.0 keV) photons are shown in green and hard (2.0-12 keV) photons are shown in blue. A complex pattern of extended emission can be seen in the lowest energy band whilst higher energy photons are emitted in parts of the inner regions. Areas with a lot of high-energy emission can be identified as bluish in the image. The most widely accepted picture of cosmic evolution is based on a model of structure formation where small structures form first and these then build the larger structures. Galaxy clusters are the largest and most recently formed objects in the known Universe. As such they are key elements in the structure formation process and important probes for testing cosmological models. Observations of galaxy clusters with X-ray satellites have revealed large amounts of very hot gas trapped between the galaxies. A record of how this gas has been heated and cooled over a long period of time is stored in the X-ray emission; this provides crucial information about how the galaxy cluster formed. 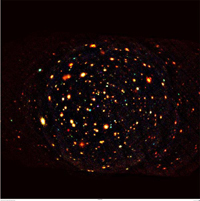 In these XMM-Newton images of three galaxy clusters the colours provide an indication of the temperature of the internal gas of the clusters, and the brightness is a measure of the gas density. From the temperature and density distribution, the physically very important parameters of pressure and entropy can be derived. Entropy is a measure of the heating and cooling history of a physical system. These three images illustrate the use of entropy distribution in the X-ray luminous gas as a way of identifying various physical processes. Entropy has the unique property of decreasing with radiative cooling, increasing due to heating processes, but staying constant with compression or expansion under energy conservation. The latter ensures that a ‘fossil record’ of any heating or cooling is kept even if the gas subsequently changes its pressure adiabatically (under energy conservation). Supermassive black holes are believed to lie at the centre of most large galaxies, including our own. X-rays are a powerful probe of the environment around these supermassive black holes. As matter accretes around the black hole it heats up and emits X-rays which illuminate and are reflected from the matter before disappearing beyond the event horizon. The study of the X-ray emission, believed to originate close to the black hole, is therefore a potent means to understand the physics and the geometry at work in these extreme conditions. XMM-Newton observations of a distant active galaxy, 1H0707-495, have probed closer than ever to a supermassive black hole lying deep at the centre of the galaxy. An analysis of the XMM-Newton spectra revealed two bright features of iron emission (the iron L and K lines) in the reflected X-rays that had never been seen together in an active galaxy. This simultaneous detection has provided unique details of the geometry and dynamics of the supermassive black hole at the centre of this galaxy. Gamma-ray bursts were first detected in the late 1960's. These energetic eruptions of gamma radiation initially had no discernable counterpart and it wasn’t until 1997, with the detection of a faint X-ray counterpart of GRB 970228 by the Italian-Dutch satellite BeppoSax, that progress could begin to be made in identifying the origin of these powerful explosions. While a consensus appears to exist to account for the origin of one class of gamma-ray bursts a number of questions remain. The X-ray afterglow of gamma-ray bursts is an important source of information about the radiation processes at play and the environment of the burst. Detecting this afterglow is a great challenge since it fades rapidly. Just 6 hours after INTEGRAL had alerted the astronomical world to the existence of a new gamma-ray burst, GRB 031203, XMM-Newton turned its instruments towards the region of the explosion. The images obtained by XMM-Newton revealed the first detection of a time-dependent dust-scattered X-ray halo around a gamma-ray burst. 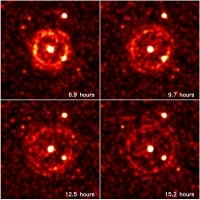 Two rings are seen, concentric with the X-ray afterglow, and appearing to expand outwards. In fact, the apparent rate of expansion is a thousand times the speed of light and the two rings are caused by separate dust slabs between the observer and the burst at distances of 880 and 1390 parsecs. The rings appear to expand outwards because light scattered at a larger angle to the line of sight take longer to reach the observer, hence giving the appearance of an expanding circle. This observation provides highly accurate distance determinations to the dust. The Lockman Hole, a region in the Ursa Major constellation, is one of the best studied fields in X-ray astronomy. In this direction absorbing material such as dust and galactic hydrogen is at its most sparse, and through this 'hole' sensitive searches for faint extragalactic objects, such as quasars and active galaxies, can be made. A number of X-ray satellites, including ROSAT and Chandra have surveyed this region. The advantage that XMM-Newton brings is the ability to perform detailed spectral analysis for a large fraction of the detected sources, even the faintest, thus providing insight into the cosmological evolution of the X-ray Universe. This XMM-Newton image of the Lockman Hole combines images from all EPIC cameras obtained during observations of this region that were made between April 2000 and December 2002. The view gives a 'real colour' representation of all the sources, coded according to their X-ray hardness: red, green and blue correspond to the 0.5-2, 2-4.5 and 4.5-10 keV range, respectively. In the survey region of 0.2 square degrees a total of 409 sources were detected, among them a conspicuous number of highly absorbed AGN. Since the mid-1930's astronomers have postulated the existence of dark matter – a hypothetical matter that cannot be detected by its emitted radiation but only inferred by its gravitational effect on normal (baryonic) matter. Mapping the distribution of dark matter in space and time is fundamental to understanding how galaxies grew and clustered over billions of years. Tracing the growth of clustering in the dark matter may also eventually shed light on dark energy, a force which repels matter rather than attracts it as gravity does. In the popular concordance model of the Universe normal matter accounts for 5%, dark matter 25% and the remaining 70% is attributed to dark energy. This image is the first large-scale map of the dark matter and baryon distributions in the universe. 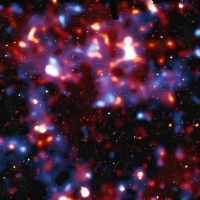 The distribution of normal matter (in red) was determined mainly by XMM-Newton, dark matter (in blue) and stars and galaxies (in grey) were observed in the optical band with the Hubble telescope. All the baryons observed by XMM-Newton are located within dark matter clumps and filaments. This means that normal matter, mostly in the form of galaxies, accumulates along the densest concentrations of dark matter and that the galaxies and clusters of galaxies are assembled inside a dark matter scaffolding. This map is an important cosmological result and it confirms conventional theories where the filamentary structure of the Universe was formed under the pull of gravity.